I've found oddles of inspiration for my home via other blogs. The one I continue to enjoy the most came from Suzy @ Worthing Court When I first became aware of blogs, some how I came upon her laundry room and went nuts over it. 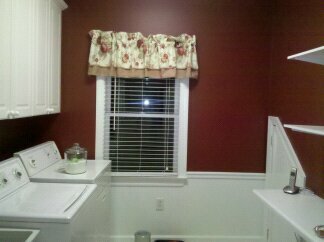 The color was great, she had a traditional styled washer/dryer ( like me) and this drying rack that I HAD to have! So, after much searching on the internet I found that rack or at least one that was similar and ordered it. Here is what the room look like just after we moved in. Now feast your eyes on this! Just changing the paint color made me feel all happy inside while doing the heaps of dirty clothes that only boys bring home. The paint color is Koi Pond by Sherwin Williams. Please notice the wall mounted drying rack (that revolutionized the whole laundry experience for me)....just like Suzy's...almost! The shelves were added prior to the built ins in the living room and at that point I was desperate to have somewhere to put school stuff for both boys. The whole wall was just blank and I thought, why not! My Daddy installed the shelves with my Mother overseeing the whole project, might be the right time to mention that Mr. Positively is not handy at all or at least that is what he tells me! As you can clearly see, we have a cat, actually we have three. Pictured here is Smoke and sadly this is the best location for their litter boxes. Only 2 of the cats are inside only cats. The little door you see in front of Smoke is a great storage space under the back stairs leading to the bonus room. One day soon I'll share this spot! Love it! The color change made a huge difference. I painted my laundry room green too but I had to match it to the green in the vintage linoleum lol! I love how yours turned out! Fresh and new looking! Love the open shelves too. I love it Tamyra! You did such a great job. Thank you for the shout out! I love the color "Koi Pond". I'm going to use it in my new kitchen.